Soundbars aren’t normally the go-to option for crazy immersive surround sound, but a Samsung-Dolby partnership is hoping to change that. Using a pair of rear speakers, a soundbar and the ceiling of your den, Samsung’s trying to recreate the 3-D feeling of a Dolby Atmos cinema. Atmos is meant to be the final evolution of cinema sound, doing away with five or seven speaker channels to create an entire 3-D audio environment. Thanks to the need for speakers in (or aimed at) the roof, it’s being rolled out very slowly to movie theaters country-wide. 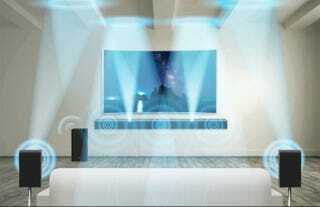 Samsung’s new partnership with Dolby is meant to bring Atmos to your home relatively easily. The complete HW-K950 comprises a front soundbar, two wirelessly connected rear speakers, and a subwoofer. With all that, you get a 5.1.4 channel system: five regular speaker channels, a sub, and four extra drivers in the soundbar, which bounce sound off the ceiling to create that 3-D effect. Samsung’s not the first to make an Atmos-enabled soundbar—that honor goes to Yamaha’s YSP-5600. But whereas Yamaha’s trying to make a complete sound system from just one source, Samsung is using those separate rear speakers, and more upwards-facing drivers to give a more immersive effect. If it comes at the right price, it could be a very simple way to create a killer home audio system.